Arrye Rosser, natural resources chair for League of Women Voters of the Akron Area, presented “Cleaning Up the Cuyahoga and Celebrating Our Success: A 2019 Preview” at the January All Member Monthly. She talked about the Cuyahoga River Area of Concern, the Cuyahoga River Water Trail, and the 2019 river celebration plans. We've included a list of links at the end of the article to help you navigate the many opportunities Northeast Ohioans will have to celebrate the river's progress. This June, northeast Ohio communities will be celebrating 50 years since the last time the Cuyahoga River caught fire. Rosser's presentation outlined about the many efforts since then to assure health of the river. She listed the many organizations that are coordinating efforts to have a terrific celebration throughout the region. As unfortunate an incident as the 1969 fire was, it ushered in a new period of environmental poicy to protect water and air, Rosser said. The 70s saw the establishment of the Environmental Protection Agency, the passage of Earth Day and the passage of the Clean Air Act and the Clean Water Act. The river had been designated as an "Area of Concern" due to its condition by the US and Canada in its compact to protect the Great Lakes. The river is one of 27 areas of concern. Rosser was happy to say that, with the progress of the past 50 years, the Cuyahoga is due to be removed from the list in 2024. The removal of dams in Kent, Munroe Falls and Cuyahoga Falls have attributed to that. 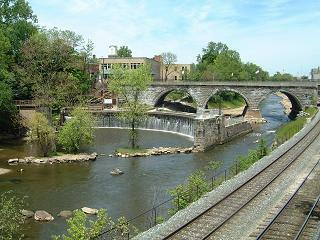 The Gorge Dam and a dam in Brecksville are also on the list. The big news for the Cuyhoga this year is that application is being sought to make it an Ohio State Designated Water Trail. A ribbon-cutting ceremony is set for June 22. An upgrade to a National Designated Water Trail is the focus for 2020. Kent LWV is being asked to write a letter in support of the application. The water trail celebrates the improved health of the Cuyahoga River and provides exciting new recreational opportunities for local residents and for tourists. It will give an economic boost to nearby communities. So June is a big month for the Cuyhoga River and communities along the River including Kent. In Kent, the Edith Chase Symposium will offer a keynote presentation and poetry about the "Resurrection River." The symposium sponsors are Kent Environmental Council and the League of Women Voters of Kent. The events are free and open to the public. The events in the region include art shows, museum exhibits, literature events, music, talks and festivals. Check out the list below to see the listings and keep checking back as new events are added.